Twenty-five years after Paul Gascoigne cried his way into the nation's hearts, another England player's tears are again the defining memory of a tournament. Laura Bassett's heartbreaking own goal in injury-time saw England women suffer a 2-1 defeat by Japan in the Women's World Cup semi-final. 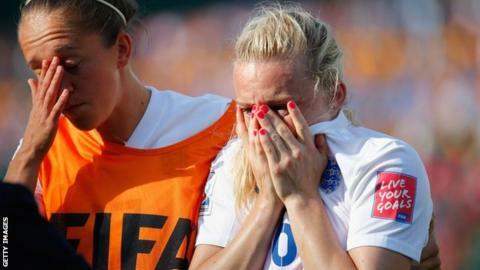 The Notts County defender left the pitch in tears, inconsolable after the Lionesses missed out on their first World Cup final appearance. But she was not the only one in tears. Team-mates cried, fans wept and television pundits struggled to compose themselves. Even manager Mark Sampson looked like he had been crying as he walked into the post-match news conference. But England fans have been here before. Gascoigne's exploits on 4 July 1990 in the World Cup semi-final against West Germany in Turin will live long in the memory. He had been the star of Italia 90 with his flamboyant skill, incredible ability to take on - and beat his man - and wacky personality. But he could not stop the tears after a mis-timed lunge on West Germany's Thomas Berthold saw him shown the yellow card that would rule him out of the final, if England got there. Bobby Robson's England eventually lost 4-3 on penalties with Chris Waddle missing the penalty that Gascoigne had been scheduled to take, but was still too upset to do so. It did not take long for the comparisons to start between Gascoigne and Bassett's tears, with readers of the BBC Sport live text commentary contributing on Twitter. Andrew Burton: "I'm old enough to remember the last England World Cup Semi-final in 1990 and Paul Gascoigne's tears. This is worse. Beyond gutted for Bassett." Gary Koh: "1990 Paul Gascoigne. 2015 Laura Bassett. The tears keep flowing from the English jersey - in such a heart-wrenching manner." Kendra K: "I hope Bassett's tears will be as iconic as Gascoigne's." Match of the Day presenter and former England striker Gary Lineker, who was the first to see that Gascoigne was in tears in 1990, tweeted: "What a dreadful way to lose! Poor, poor Laura Bassett. Despite the gut-wrenching nature of the defeat, England's women were terrific and should hold their heads high. Great effort! Former USA international Landon Donovan said: "Absolutely devastated for Laura Bassett. We all make mistakes and I hope she doesn't let this define her." England international defender Micah Richards wrote: "Did anyone shed a tear then? Cruel. Well done England." Read more on Women's World Cup: Will England run bring lasting change?